Wagyu beef / scallop tartare - oooooh boy! This was gooood! 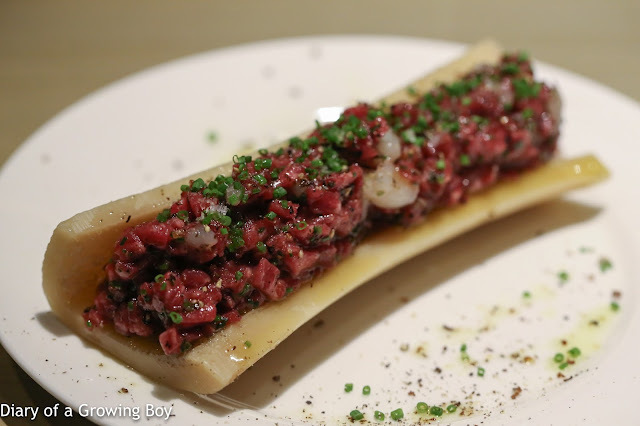 The beef still had plenty of chewy texture (since it wasn't minced but chopped), and worked pretty well with the scallop. Very nice with a little kick. 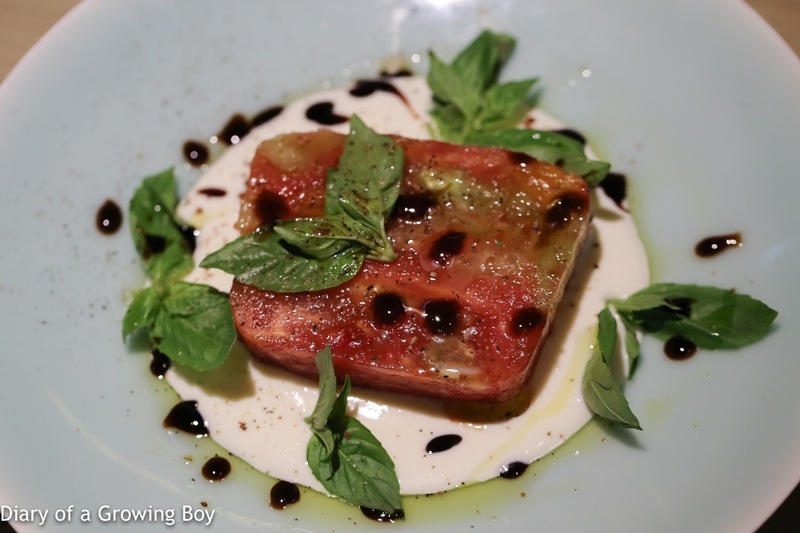 Heirloom tomato terrine / burrata cream - I finally got around to having this, and it was damn good. I love how the tomato was compacted into a terrine, so the texture was pretty firm. 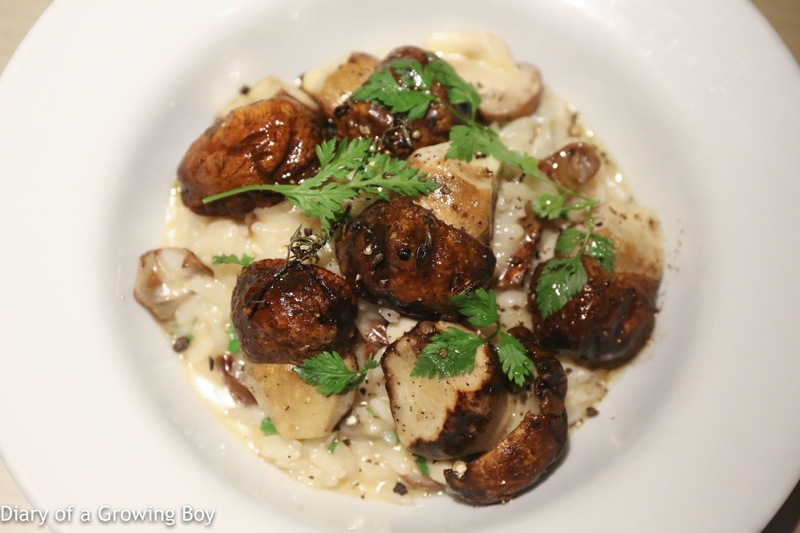 The flavors were all there, and the creamy burrata worked very well. The basil was very, very fragrant and strong... with a nice kick. Sicilian red prawns fritter - these were really, really good. 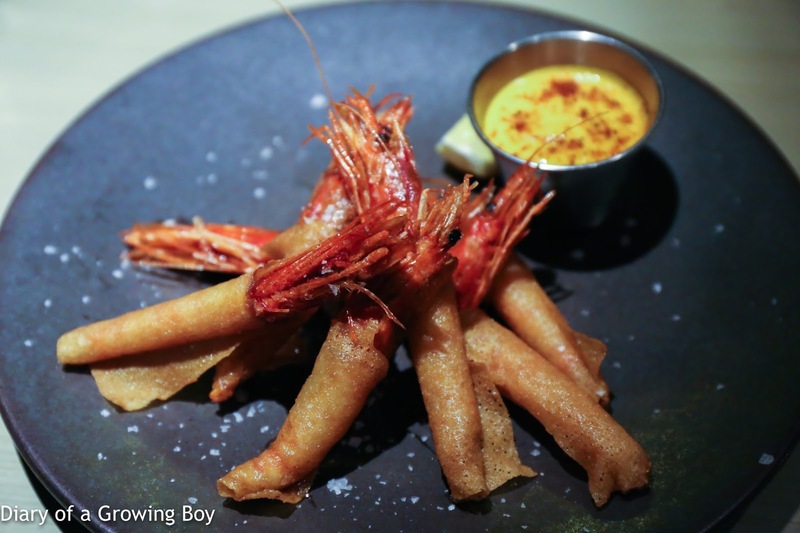 Basically finger food, but just totally awesome - especially with the piment d'espelette in the mayo. I could picture myself eating a couple of plates of these without being able to stop myself. And yes, with the whole heads, too! 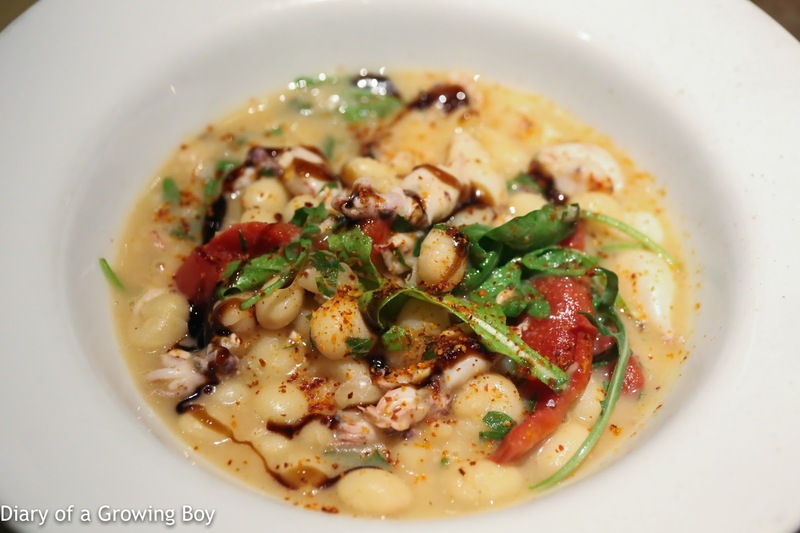 Sicilian baby squid / borlotti beans - this was pretty decent. I'm used to this coming with squid ink, so this seemed a little lighter in flavors tonight. The piment d'espelette picked things up nicely. Girolle mushrooms / sea urchin / sweet corn frittata - what's not to like?! 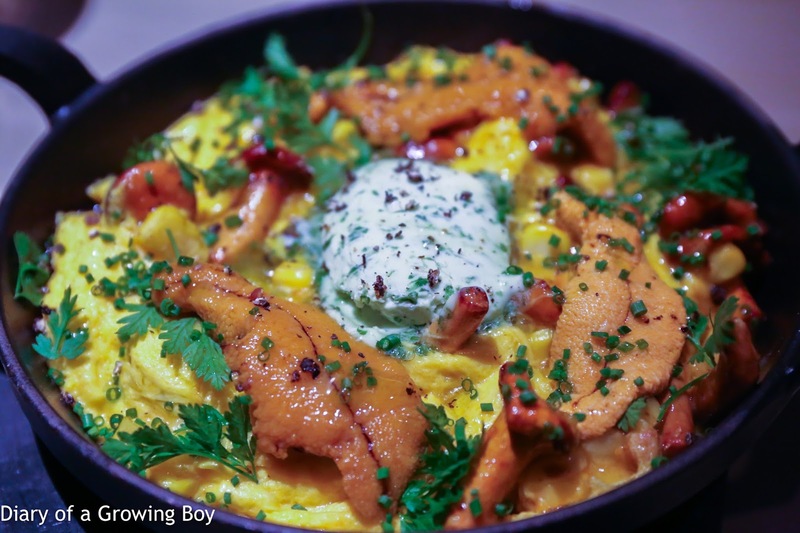 Big tongues of sea urchin on top of fluffy egg frittata omelette with crunchy corn kernels, along with sautéed girolles. Topped with some herb crème fraîche and lots of chervil and chives. Acquerello risotto with fresh porcini - this was perfect. These porcini were so fresh and tasted of fall (autumn for those of you who speak Brit). So simple, so hearty. 'Nuff said. 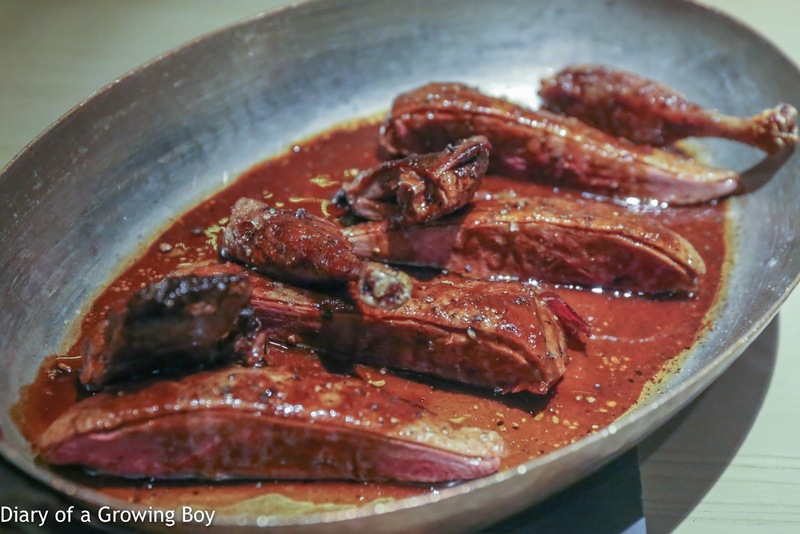 Roast wild mallard duck - we had pre-ordered this on the advice of the boss, and this was certainly something not easily found in Beijing. Unfortunately the Man in White T-shirt ended up overcooking the duck somewhat, although as he said, it actually becomes more gamey and flavorful when it is overcooked. 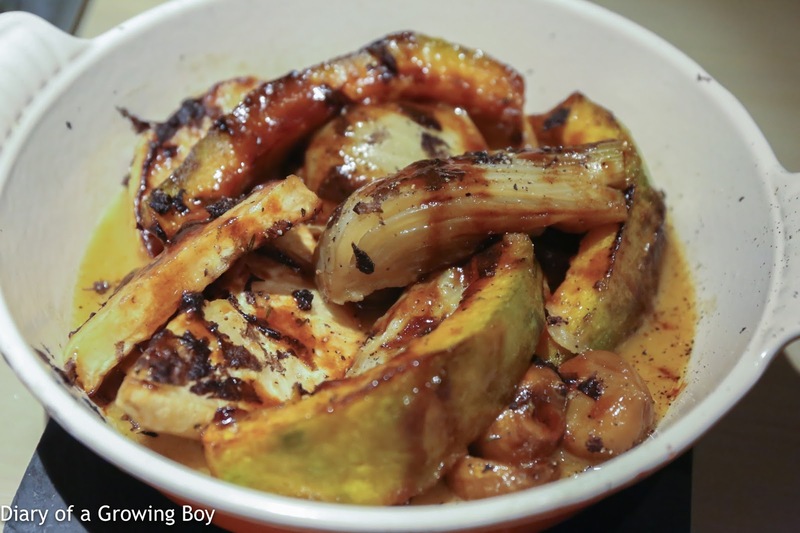 Braised autumn vegetables - pumpkin, fennel, and chestnuts. Definitely feels like autumn fall. 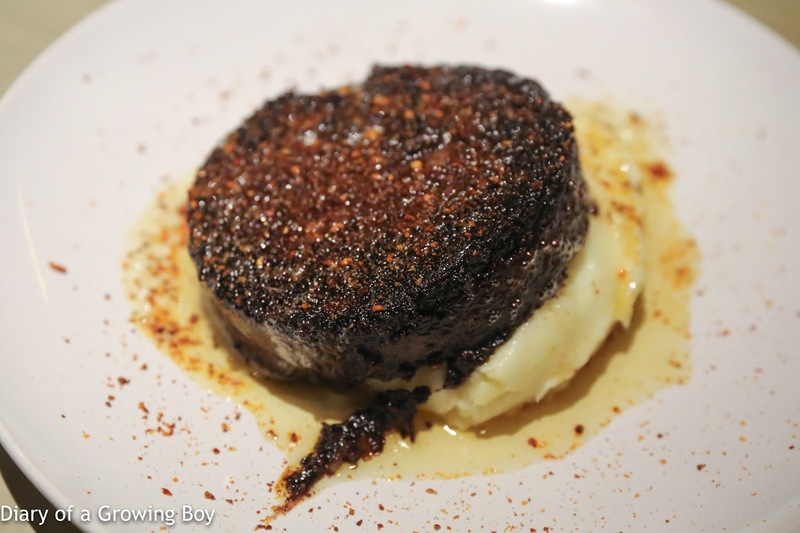 Boudin Basque "Christian Parra" - Mr. QLI couldn't resist the temptation to order this, because again this was something he simply wouldn't find in his adopted city. As for me, there is no situation where I wouldn't be happy to have this. 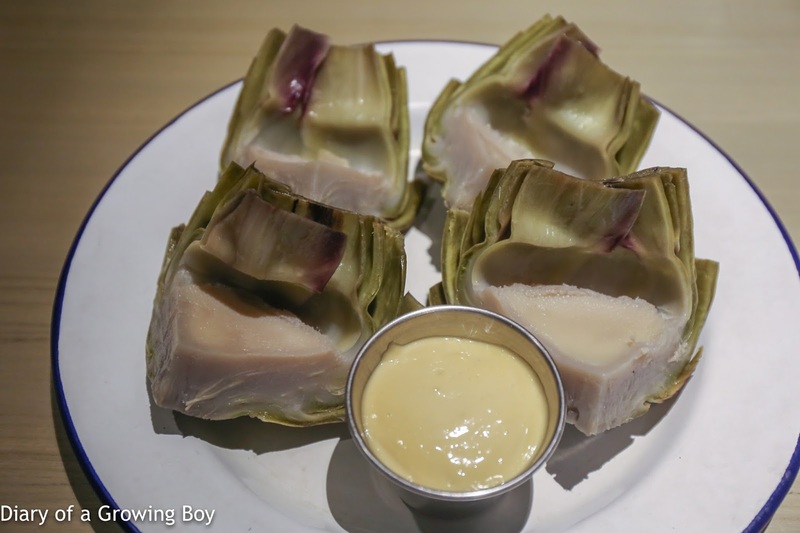 I love it for its full and bold flavors as well as the texture. Canelés - chomped two. Happy. 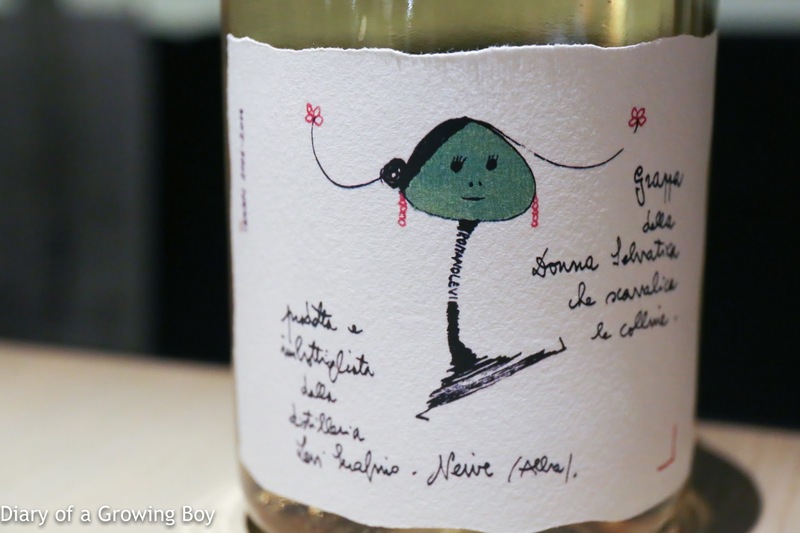 Our meals together are never without wine, and since he was generous to share a very delicious bottle of Riesling with me last month, I brought along a couple of bottles I thought would drink well. Mr. QLI also generously contributed another delicious bottle, and we shared all of them with the Man in White T-shirt. 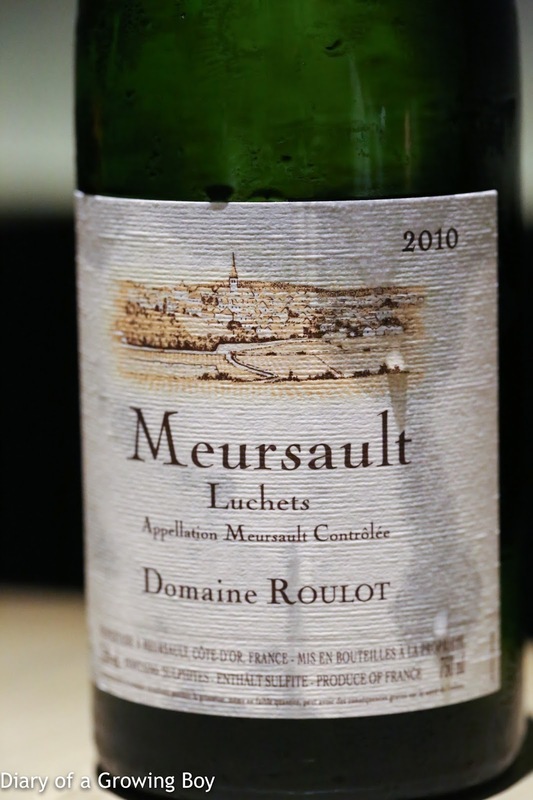 2010 Roulot Meursault Ruchets - lemon and flint notes. Drank better than my last bottle 2 years ago. 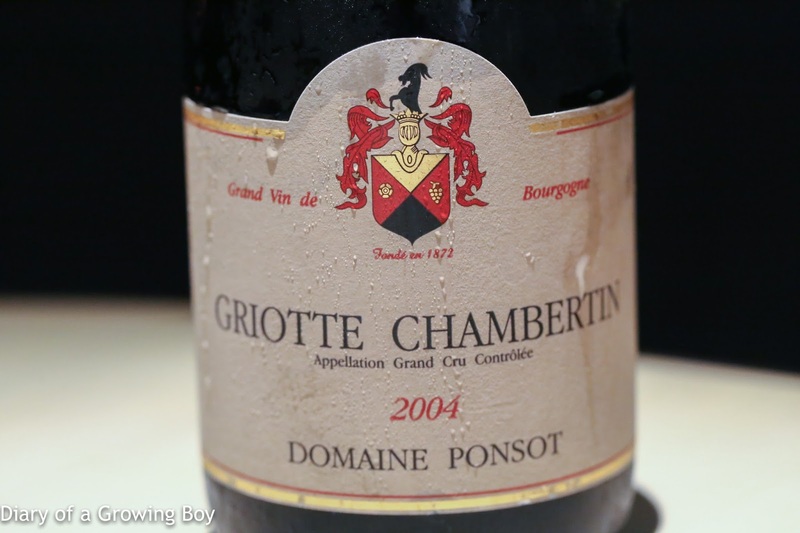 2004 Ponsot Griotte Chambertin - plummy and alcoholic on the nose, with leather and almost a hint of floral notes. After 3½ hours the nose was more musty and animal. Drinking pretty nicely. 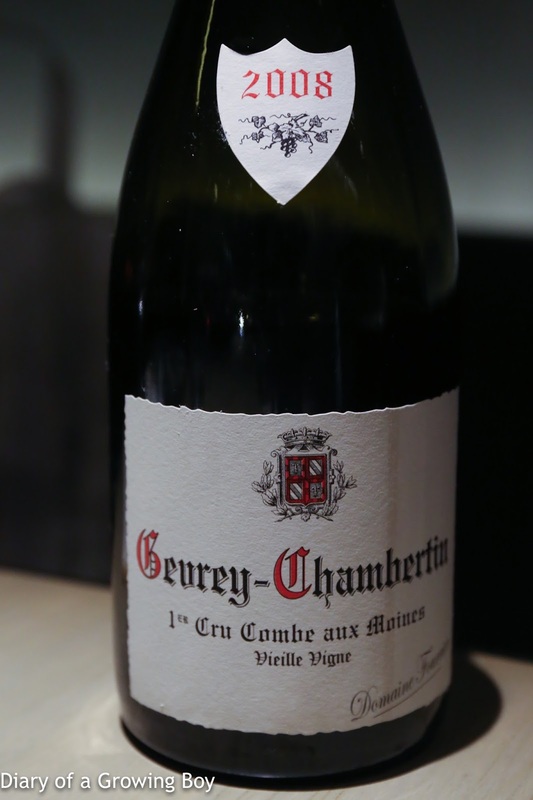 2008 Fourrier Gevrey-Chambertin 1er Cru Combe aux Moines - more concentration here, with eucalyptus and cool fruit. Lovely. 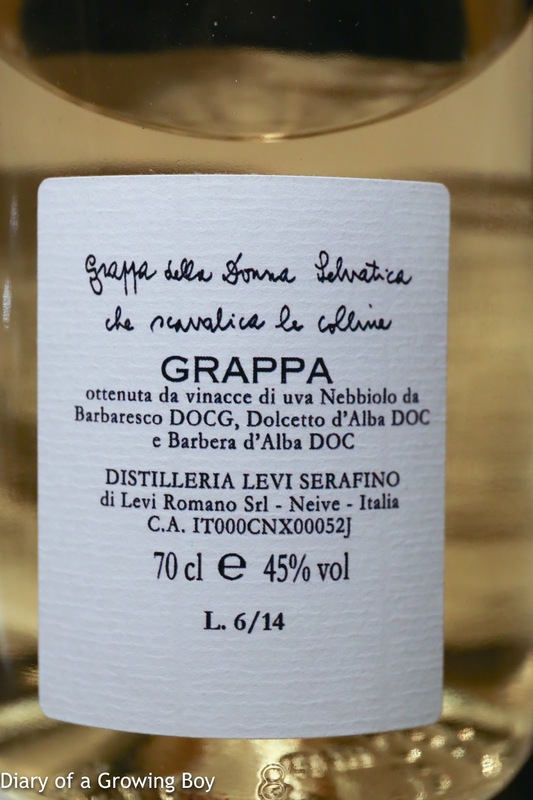 Grappa della "Donna Selvatica che scavalica le colline" Riserva 45% vol. Bianca - definitely singed the hair in my nose a little. A little herbal notes. A generous treat from the boss.